The first inter-professional team to earn certification in tobacco cessation treatment included family medicine, pharmacy and respiratory therapy professionals among others. Kicking the habit, whether it’s smoking or chewing tobacco, is hard. Researchers have discovered “it may take 30 or more quit attempts” before tobacco users truly quit. The results were much higher than the often estimated 10 attempts at quitting. Inconsistent and contradicting treatment plans from dentists, physicians, pharmacists and other healthcare providers can present added challenges to a patient who might be desperate to curb nicotine dependency. In the fall of 2017, the West Virginia University School of Dentistry became the first dental school to become certified by the Council for Tobacco Treatment Training Program (CTTTP) to teach others about evidence-based treatments that meet the diverse needs of tobacco users who have an interest in quitting. Susan Morgan, DDS, clinical professor and lead of the tobacco treatment training program at the WVU School of Dentistry, said, for example, if one provider is familiar with the most effective cessation treatment but another provider treating the same patient is not, a patient could run into trouble having prescriptions filled. “It’s disheartening when various providers for the same patient are not in agreement with use of evidence-based recommendations for tobacco cessation treatment. This program has the potential to improve cessation rates and improve the quality of life for our number one concern, our patients,” she explained. The program is aimed at getting physicians, dental professionals, pharmacists, respiratory therapists, counselors and others following similar guidelines and working inter-professionally to determine cessation solutions specific to each patient. This summer, 19 participants successfully completed the dental school’s four-day curriculum that included extensive discussion, case study review, role playing in the areas of behavioral therapy, medicine and nicotine replacement therapy and advice to address relapse. Participants in the training program attended from West Virginia, Ohio, Maryland and Texas. Their backgrounds included medicine, nursing, dentistry, social work, pharmacy and respiratory therapy. Faith Lewis, Respiratory Therapy Care Management for Outpatient Services for Meritus Health, is one of the 19 men and women who earned certification at the School of Dentistry’s first CTTTP continuing education course held in May and June. “The goal is, no matter what role you play, being proactive and getting to the end goal of sticking up for the patient and presenting other options,” Lewis said following the certification exam she was required to successfully complete to be able to practice in Maryland. The Centers for Disease Control and Prevention reported in 2015 that seven out of every ten adult cigarette smokers (or 68%) wanted to quit for good. “Patients get mixed reviews and then they wonder who is right and who is wrong and then it makes them doubt. If they doubt, I feel they will be less successful versus being more confident in their provider,” confirmed Lewis. Family physician and United States Air Force consultant Dr. Gregory Sweitzer successfully completed the certification program. He explained a tendency for academic isolation within health care education programs. Family Nurse Practitioner Rose Clark also completed the continuing education certification course. “The speakers did a marvelous job. I feel more competent in prescribing the correct nicotine replacement therapy or oral medication now,” she shared in a review of the course. Sweitzer expressed his interest in sharing the inter-professional based tobacco treatment model. 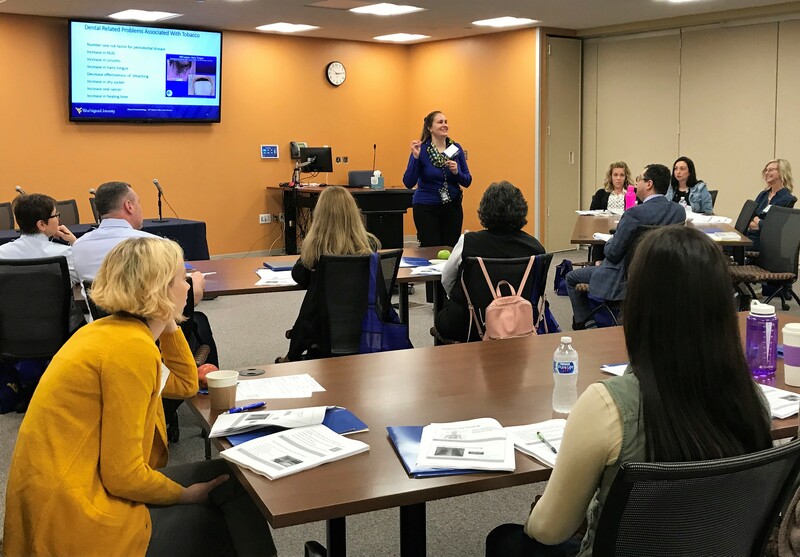 Lauren Swager, MD, was one of more than a dozen presenters at the inaugural certification course at WVU. She is an associate professor in the Department of Behavioral Medicine and Psychiatry at the WVU School of Medicine. “Nicotine dependence is one of most important risk factors to address to improve the health of West Virginia and all Americans. It requires a comprehensive team that is inclusive of all members of the health care community to address the complexities and challenges of nicotine use,” she said. Swager has participated in the treatment of adults and adolescents with a variety of addictions and substance abuse problems. She said she is encouraged by the opportunity to educate other providers and learn from them as well. Presenters had expertise in dentistry, medicine, nursing, counseling, dental hygiene, head and neck cancer and advanced pharmacy. The WVU School of Dentistry certified tobacco treatment training program required 24 contact continuing education hours. Participants had to earn an 80% or higher on the final exam to receive certification through the program. Plans are underway at WVU for another CTTTP continuing education course within a year.